I've decided to call this block "Purse Strings" since it looks like the top view of a drawstring bag, and the more blocks I put together, the more I love them! (Other great names were suggested, but several of those were already assigned to other blocks) If you read my blog often, you know that I like quilts/blocks that are fairly easy to piece, and yet make a big impact. This block gets a check mark in my book for both of those qualities! To make a purse strings block, cut four 5.5 inch squares to make the "purse flaps," four 5.5 inch squares to make the "strings," and one 5.5 inch square for the center of the block, or the "inside of the purse." 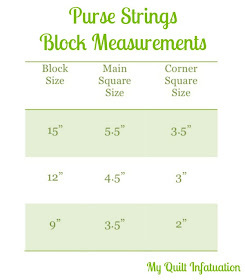 This center square would be a great place to use fussy cuts! You will also need sixteen 3.5 inch squares of your background fabric (or, corner squares). I am using only three fabrics (plus white), but this would also be really cute as a scrappy block! First, we'll make the four "purse flaps." These surround the center square, so if you have a stripe, chevron, or other design that would look cute in a radiating pattern, go for it! To keep your stitch line straight, many people recommend drawing a diagonal line across the back of your square as a guide. I really hate this step, so as a little trick, I use a piece of painter's tape aligned with my needle on my machine and table. You can keep the corners in line with the edge of the tape, and know that you're sewing a straight line! After sewing, take your scissors and trim away the excess, leaving 1/4 inch seam allowance. It doesn't have to be too perfect! Give it a quick press, then line up another white square with an adjoining corner. Sew corner to corner in exactly the same way! Trim away the excess, and press again! Repeat these steps for all four "purse flap" pieces. I promise, once you get the hang of it, it goes really quickly, and the end result is worth it! The points on these don't go all the way to the edge of the block (unlike flying geese), and that's by design. When the blocks are all put together, it creates a great shape in the negative space! Now, we'll use the same technique to create the "drawstring" parts of the block, better known as a Road to Tennessee block. These are a little bit quicker because you won't have to press until the end. Start by lining up a white square on top of your printed fabric and again, sewing corner to corner and trimming the excess. Don't worry about pressing this just yet! This time, our second white square will be sewn to the opposite corner, rather than an adjoining corner. Sew the second piece and trim. Your piece should look like this. Now we're ready to press! Be careful not to drag the iron too much or you'll distort your corners! Repeat for all four "drawstring" pieces! After all of that, the rest is really a snap! Lay out your blocks like this- Do you see the purse and strings shape? Sew them together as you would a plain old nine patch. Give your block a final press, and voila! A beautiful Purse Strings block! Of course, the real beauty of these blocks happens when they're all put together! Lots of quilt blocks are like that. I love the little figure-eight shape created between these. I can see lots of opportunities for some creative quilting in these little negative spaces! Edited 9/21- Here is what the blocks look like all together in the finished quilt! You can find additional pictures of the finished quilt HERE! Love it!! Great job. Pinned! Love!! And thanks for sharing! That long piece of tape is genius! I hate drawing those lines, so I'll have to try it. And I love the white joined squares that these blocks make when you put them together. I bet they'd look awesome if you set them on point. I'll have to add this to my list of blocks to try! Such a great block Kelly! I love that it's so big and comes together quickly. Great job. This looks so easy even I could do it. Thanks for sharing! Very nice Kelly! Congratulations on what looks to be a new block design! Woohoo ! This is such a great block! Kelly, your "purse strings" block looks lovely. I'm glad to see you did'nt change your first sketch. It turns perfectly and is so a new one. Thank you for such a good idea ! This looks great! I might have to try this one out. Adorable! What a great block! Fantastic job Kelly! I love the negative space it creates! I love this and I'm marking it on my to-do! Great job! I LOVE THIS!!!!!!! thank you sooooooooooo much for sharing. So beautiful! Thank you for sharing the love...I just need more hours in the day to do all the projects I want to explore but this one just ran to the top of the list! going to do the purse strings block for a customer cannot wait to get started. es hermoso, pero alguien me puede pasar las medidas de cada tela? gracias! I like your purse strings pattern. easy to hand quilt. I just love this block. I whipped one up in no time for project Linus. It turned out so cute. I couldn't find the book I made this from years ago,then I ran across yours on Pinterest. So I had to make it again! Thank you! I love your quilt. You did a wonderful job matching the colors. I've been scrounging my Pinterest saves for a block pattern for a vintage sheets block swap I'm part of (#vsqltblkswap on Instagram). Ding!Dinf!Ding! I've found a winner! 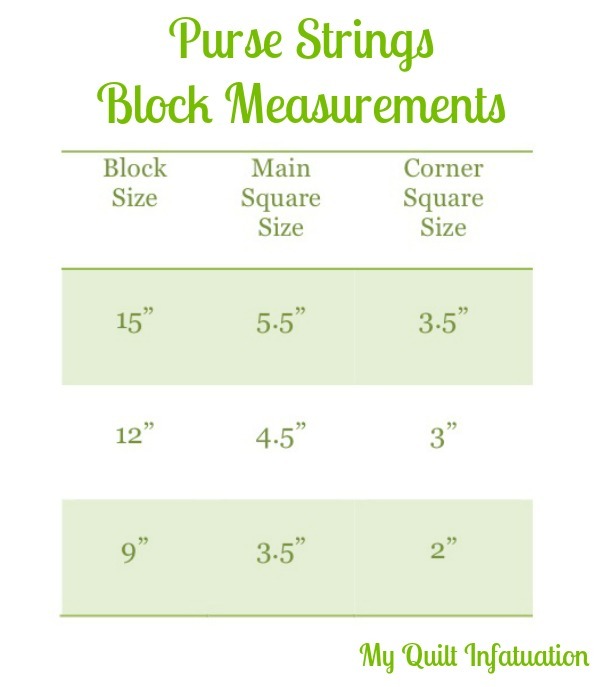 Thank you for sharing this fab block and tutorial to the world.